I just wanted to send out a big THANK YOU to everyone who joined my blog this weekend. I finally do not feel like I am talking to myself! Also, a special HELLO to Vintage Makeup who has been asking me lots of questions on makeup and it has been super fun helping her out. Some of you might not have spotted our conversations in the comment section so I thought it might be nice to share with you all. The big stumbling block for me when it comes to questions about make up is I wear very little. My cosmetic routine consists of foundation and for special occasions I may use blush, lipstick or a lip tint. I had so many allergic reaction to makeup on the high street that I gave up on that years ago. Green beauty is a new trend, when I was a teenager (the time when most of us experiment with makeup) I was not aware of natural alternatives or whether they were even available. 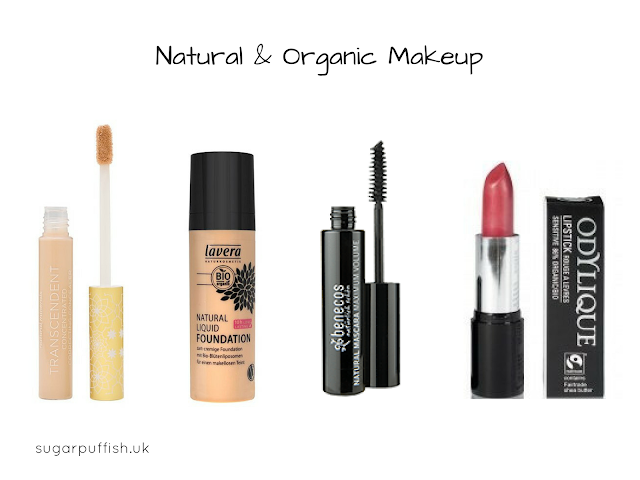 You're unlikely to find natural mineral makeup at Boots and Superdrug so the alternative on the high street would be a local wellbeing store or Holland & Barrett. Brands to look out for here are Benecos, Pacifica and Lavera. Shopping online opens up more options and the market is always expanding. Check out websites such as Love Lula, Naturisimo, My Pure, Content Beauty, Glow Organic, Lucy Rose and Big Green Smile. I'd recommend looking at brands such as Ere Perez, Green People, Odylique, Inika, Dr Hauschka, Antipodes, RMS Beauty. I hope this has been of interest and helpful. Let me know if you try any of these brands. I checked out their site, looks like an awesome company with good ethics, Paint Me Loving & Paint Me Content look great colours. Pretty blog! :D I love the background you chose! @LauraJean396 - thank you & yours is very nice as well, I like neutral colours it is easier on the eyes when reading (gosh I sound old lol). I hope you had a great weekend? Hey, I love your blog its great! I have combination skin and sometimes I do get allergic reactions to products which is quite annoying. @JayBee - you are more than welcome to link or recommend my blog. It is nice to hear from someone who also has sensitive skin. I started this blog to share my experiences as I can not use the top brands that other bloggers recommend. Using more natural or chemical free products makes a big difference for me, I definately have lowered my rate of reactions.